People (always) say that they can't lose weight because they feel deprived. Or that "healthy" food tastes bad. To both of those I say bolshevik! You can eat whatever foods you want after a few simple (mostly unnoticed) changes to the recipe and still make your goals. It has been far too long! But here it is: My recipe for a Low Fat (but still delicious) Hidden Valley Ranch. What is it about Hidden Valley Ranch that makes it taste so good? I have no idea their secret and I have given up on making a completely from scratch version as they've never turned out right. I have however found a lower fat version that tastes very good. Yes I know Hidden Valley makes a low fat version of their ranch that is nutritionally "better" than this recipe but I this recipe actually tastes good. First the Ingredients: 1 Packet Hidden Valley Ranch. 5 ounces 0% Fat Greek (or normal) Yogurt, 1/4 cup Light Mayonnaise, 1/4 cup Light Sour Cream, and 3/4 cup Skim Milk. Dump the Yogurt, Mayonnaise and Sour Cream into a bowl. Then add the packet of Hidden Valley Ranch mix and stir until combined. Add in the milk and start stirring. Don't be alarmed if it looks lumpy and like soupy cottage cheese as pictured below. Just keep stirring. After a few minutes the dressing will come together. It's a little thin at this point but will firm up after an hour in the fridge. Yes: You can make this recipe with just the 0% Greek yogurt and Skim milk, however going back to taste- for me this is the perfect balance. I've found my camera! I'm so excited for this next recipe so I can use it! I will not be so bold as to say the pictures will be any better, but I'm going to try my very hardest for you. I can guarantee there will be more photos (step by step) for the recipes. Hopefully you're looking forward to this as much as I am. It's amazing the things you can find when you finally unpack all your moving boxes. Split Pea (and vegetable) Soup with Ham. We've had a shift in weather recently : The snow has melted and the wind has become extraordinary. Gusting through the trees, letting me know where all the weak spots are around my doors and windows, pushing my car back and forth while I try to stay in my lane. Gavin and I ventured out in it a few days ago and he (almost) panicked because no matter how he turned his head the wind was attaching his face. I had to pick him up and carry him with his head buried in my chest. I kind of loved it. Not Gavin panicking, but feeling the cold wind blow all around. Hearing it holler outside while I'm snug at my computer, knowing that there's a pot of soup simmering for dinner. Ah soup. For me it is the ultimate comfort food. Warm, filling, delicious. Grab a bowl (or cup) and hunker down with a good book or movie and just let time pass around you while you snuggle in a little cocoon of peace. And of course it (can be) extremely healthy. 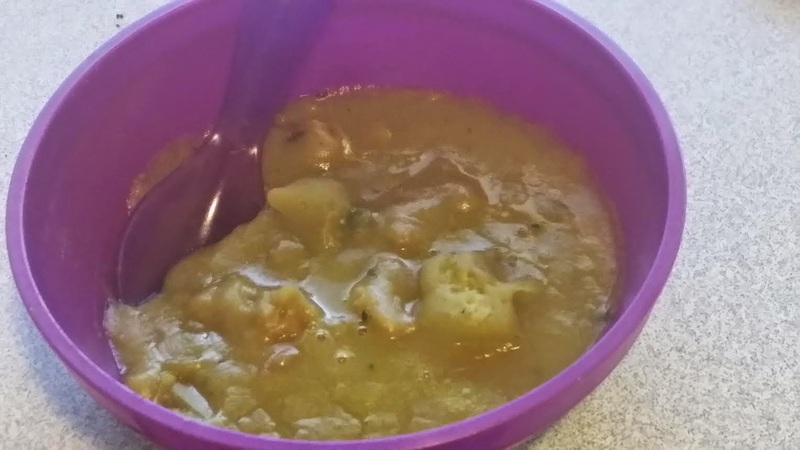 Now split pea soup is already very healthy so how can we make it better? Sneaking in more veggies! In this recipe I've used (yellow) summer squash, however feel free to substitue with whatever you'd like. Other great vegetables to sub in are: Green Beans, Spinach, Zucchini, Kale, Squash (acorn, butternut), Asparagus, Turnip, Bell Pepper. Keep in mind the flavors your adding - I would stick with 1 and a half cups of extra vegetable per half pound of split peas. That way you shouldn't overpower the star of the show. Also I have (extremely) picky eaters so I've blended the carrots, celery, and onion as well to keep their nutrition but hide their presence. Feel free to keep them whole. 1. Simmer the Split Peas, Ham Stock, Garlic, Onion, Carrots, and Summer Squash together for 2 hours or until peas are soft. 2. (Optional) Use a hand mixer and blend the vegetables until completely smooth. 3. Add in the Ham and Potatoes then continue to simmer for 20 min or until potatoes are cooked to your liking. Pro-tip: This is the perfect way to use leftover Ham. The meal is over, you've carved the excess meat off the bone and packaged it away and now you're about to take the remains to the trash. You're holding a flavorful treasure in your hands. If you don't have time that night wrap the bones up for the next day. It takes a while to cook but there's practically zero prep time and it's very low maintenance. What am I talking about? Stock of course! Oh you don't think you'd ever use it? Do you make mashed potatoes? Rice? Casseroles? Soups? Sauces? Packaged seasoned noodles? If you answered "yes" to any of these then you WILL use your stock. If you didn't answer "yes" to any of them I guess you eat a lot of fried eggs and sandwiches. In which case it's time to branch out and try new things. 3. Bring to a boil, then turn down the heat a simmer for 2 hours. 4. Remove from heat, Remove bones. Let cool to room temperature and store until needed. If you'd like to add salt, pepper, herbs, feel free to do so. Unless I have a specific meal in mind I like to keep my stock neutral so that it can work in any dish. Storing options: This can be frozen or put in the refrigerator. My method of storing is to put them in an ice cube tray- let it freeze- then package the cubes in a gallon size freezer bag. My ice cube trays hold 1 ounce per cube so when adding to recipes it takes just a moment of math to drop the right amount of cubes in. At first you might forget it's there, even I'm guilty of pouring in water instead of the stock, but soon it will be second nature. You might think it a small saving when you could purchase a can for $0.50 cents, but this gives you complete control and you know exactly what is in your stock and how fresh it is. Plus it's literally as simple as boiling water. Try it out. I promise your everyday dishes will have a little something extra in flavor and you'll be more satisfied as a result. Have you ever helped a child learn to read? First you teach them the letters, then the sounds, then slowly put together words. You teach them "ph" make the "f" sound. That "e" on the end of a word usually means the vowel will be saying it's name. There is a lot for them to absorb and it takes a while. But once they understand, and really get it, it becomes easy. They no longer have to stop and remember which letter makes what sound because it's automatic. Or when you learned a new language yourself. It was hard, but (if) you stuck with it it became easier and easier. Now you can speak ti whenever you want with hardly any thought. Learning how to eat healthy is the same way: At first it's hard and you'll struggle and make mistakes and forget. Don't let the process get you down. This is about your health, your families health, and what's more important than that? 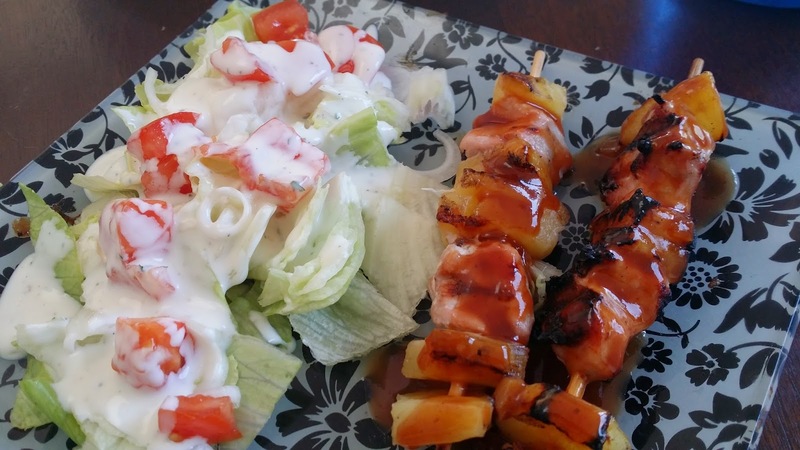 Dinner: Salad (lettuce + tomatoes + (homemade) Low Fat Ranch) + Pork (and pineapple) Skewers. I forgot to post pictures yesterday (now two days ago)! But since that time I've decided you don't need to see ALL the meals (do you?). So (from here on out) I'll only be posting photos of meals I plan to feature in recipes later. Let's just skip to the (money shot). I love sausage gravy and biscuits. Who doesn't? However taking the time to make fresh, hot biscuits and a creamy pan sausage gravy does not fit into my everyday schedule (or calorie intake). 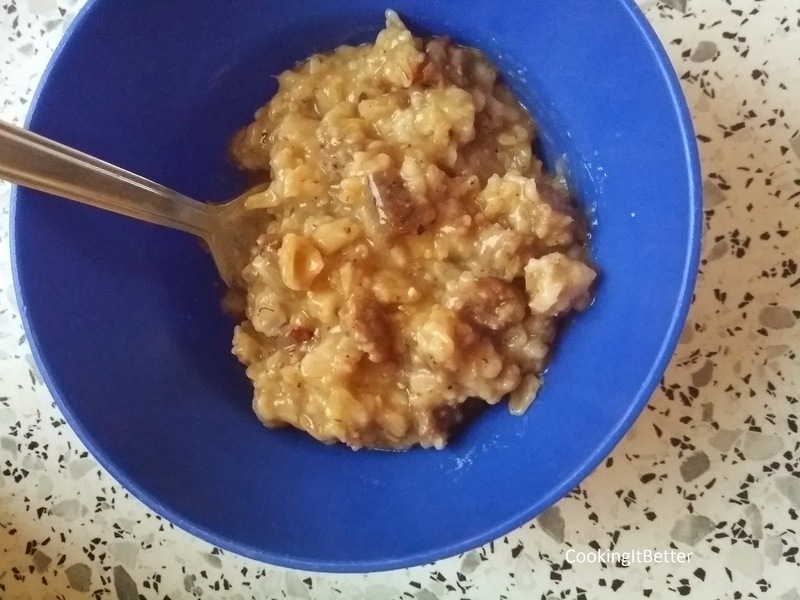 This oatmeal is a great quick choice for busy mornings and while not exactly the same still delivers the same flavors and mouth feel of a plate of the classic it's inspired from. Behold the amazing (savory) Sausage Gravy Oatmeal: Delicious, Healthy, and (super) Easy. 1. Mix the Oatmeal and Water in a microwave safe bowl. Cook for 2 min. 2. Stir in the Reduced Fat Sausage. Cook for an additional 1-2 min (time will vary by microwave oven and your own preference). 3. Add in seasonings (Seasonings should ALWAYS be personalized- put in what you want and adjust them to your taste. Different brands will have different potency levels as will how old your spices are so keep that in mind). *for a more creamy oatmeal add in a shot of milk (or cream). I am (very sadly) lactose intolerant and my recipes reflect that. I'm a normal woman (in her late 20's): 1 Husband, 3 boys, 1 dog, 1 cat, 1 full time job, 1 or 2 workouts a day, 3 meals and 2 snacks, 1 house to keep up, and no time. I have no idea what I'm doing (YET- I'm a quick learner and sharing all my discoveries with you). The hope is that by logging (everything) here I will have a platform to reach out and give (good) advice from people. Get advice to others and just be able to breathe. I will be posting new recipes every Wednesday, and general nutrition and food posts several times a week. Have a favorite dish you've been craving? Need to figure out ways to slip veggies to your kids? Contact me or leave a comment with the dish or goal you need help with.